Does your Manufacturing Partner Matter with Custom Composites? For the past 60 years, Strongwell’s pultrusion process has become a stable thermoset option for industries to address some of the inadequacies of legacy building materials. Today, that knowledge and experience has been interpreted and transferred into custom composites used in bespoke applications. Don’t know what custom pultrusion entails? Have no fear, we have a brochure which breaks it down for you. Familiar with pultrusion, but still unsure of whether pultrusion is a good option for your design? Meet Gene Smith, a veteran within the pultrusion industry who breaks down OEM, Custom, intellectual protection, competition, material sourcing, and choices. With almost 40 years of pultrusion experience, Gene Smith has served in numerous capacities at Strongwell. He has been an active member within manufacturing management, shipping/logistics, production scheduling, purchasing, customer service, and a custom products manager providing customized solutions for sectors including but not limited to hyrdocarbon extraction, agriculture, industrial, marine, chemical, utilities, water treatment, construction, pulp, transportation, automotive, telecommunications, and consumer goods. What are OEMs and why does experience matter? Original Equipment Manufacturers, more commonly known as OEMs, are companies which produce parts and equipment that may be marketed by another manufacturer. Strongwell has been an OEM for multiple companies with presence in over 20 markets. Some of Strongwell’s OEM relationships have spanned as long as sixty years. A great example of this relationship has been how Strongwell has been producing and supplying premium tool handles for tool manufacturers. Why would a custom pultrusion be a better option than established materials? In certain applications, OEMs are strictly specified for projects. However, custom or bespoke applications may arise due to timelines, tariffs, OEM availability, redesigns, or consistency in quality. In many instances, an aftermarket custom pultrusion may replace a traditional material such as concrete, alloy, or wood with a composite capable of outstanding performance and durability. Why would someone choose Strongwell vs. its pultrusion competitors? Experience and product diversity can make all the difference within the pultrusion industry. In custom pultrusions, quality can vary greatly due to overwhelming raw material selections, sourcing, manufacturing process(es), product warranties, and whether some companies are capable of honoring intellectual property agreements. Strongwell has done it all. Does Strongwell accept Non-Disclosure Agreements (NDAs) and why do they matter? Strongwell is constantly working with companies who are innovating, developing new technology, and reimagining products and want to protect their investment in the early design phases. It often makes sense to put protections in place to protect sensitive information on both sides, and Strongwell is no stranger to this. Multiple resins and reinforcements are available with the use of pultrusion. What are the options? Each custom product is designed and developed as a unique product for the desired application. Strongwell’s understanding about resin matrices allow formulations with polyester, vinyl ester, epoxies, phenolics, urethanes, and/or blends. Strongwell also has experience with specialty resins and thermoplastics. Color pigmentation can be added to resin systems to create a desired color throughout the profile. For those interested in distinctive branding, Strongwell offers graphically colored, printed, or patterned polyester surfacing veil to give the end product an aesthetic advantage. Reinforcements us in a custom designed pultrusion are based upon the needed performance characteristics. Strongwell uses fiberglass in the forms of roving, continuous filament/strand mats or other base materials. These reinforcements are then combined with additional fiberglass mats, wovens, braided materials, or even 3D multi-axial materials as ways to reinforce the end profile. These kinds of features allow designers and customers to benefit from pultrusion’s design flexibility versus traditional, off-the-shelf materials. 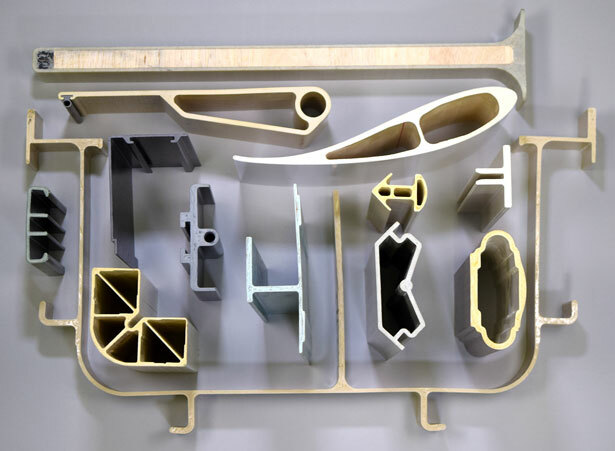 Outside of fiberglass reinforcements, there are other composite reinforcement options which Strongwell also experiments with when customers are wanting additional shear, load, or deflection strengths. Strongwell is experienced in using carbon fiber, Kevlar, and other aramids which can be introduced in tow, braids, fabrics, wovens, and biaxial tapes. Wanting to learn more, or ready to submit a design? Check out our info page and design submission form here.